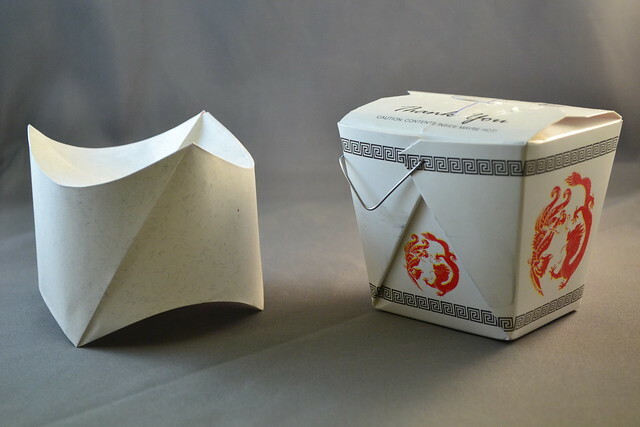 Here’s an idea that occurs to me from time to time — what if we used curved origami techniques to make a new kind of Chinese food take-out box? The venerable carton to the right is the standard oyster pail, probably made by Fold-Pak of Norcross, Georgia. Nothing wrong with that design: it’s been around for decades and is cheap, functional and not so hideous in appearance as to put you off your lunch. The box to left is a different approach to the same purpose. It is cylindrical in form, has the same volume as the traditional box — one U.S. pint — and derives its strength from its curves and internal friction. It closes with a clever double-lock, obviating the need for wire or glue closures. Because the box is round and touches the table at only three points, the heat of the food is better conserved. Plus, the meal can be eaten directly, with the opened box serving as a plate. The name? Well, I am partial to Filipino adobo and it isn’t easy to find around here. In fact, if I don’t make it myself, it simply doesn’t obtain. I am releasing the design to the wide world with the hopes that some hipster entrepreneur will fill it with adobong manok and bring it to me. One can dream, eh? The design can, of course, be licensed by anyone anywhere for the usual filthy lucre, the coin of the realm. But for a limited time, the design will be available for licensing in the Philippines (including the Spratly Islands) for the fee of one box of adobo per week for life, assignable. In the spirit of good faith, here is a PDF of the template. Commerce passes everywhere, but the box also has uses for the casual home folder. For instance, it could be filled with pralines, pizzelle, poppadom et cetera and then suspended from the festive tree with a loop of knotted ribbon. The Ron Resch Paper and Stick Film from Sheet on Vimeo. It is with some reluctance that I point at this video — not because I imagine it is sinful to do so, but because I have seen this film surface on the Internet before and the act of looking at it somehow makes it disappear. You tell your friends, “Hey, look at this!” And by the time they look, it has vanished. I took the precaution of downloading it, this time. I’m not entirely sure why I find this model compelling. The proportions are pleasing and it reminds me of Philip Shen, the way it suddenly locks together at the end. I would call it simple, but it is manifestly not. The lines are simple. The pre-folding is persnickety — fussy, if you will — and pulling the legs down one at a time deforms the model in a distracting way. For all of that, I like this model. Maybe you will, too. Here are some diagrams. It’s called Brazier after a similar traditional model — the Japanese is hibachi, I believe — a raised box on four legs. 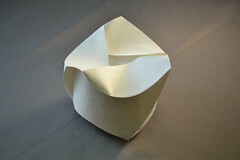 Francis Ow has made a lovely model that looks something like this (diagrammed in his self-published Geometrical Origami), but the similarity is not structural. For extra credit, you can reckon the volume. It’s easier than you might suspect. Went to the New York City Convention, last week, and it was fun as it always is, but as always, I feel a sense of not having explained myself sufficiently. 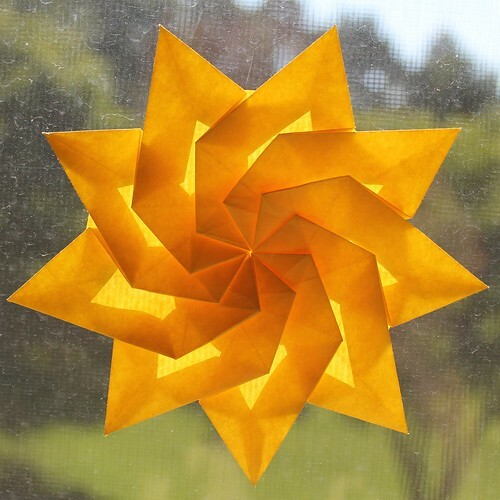 I taught a couple of classes, both on twist folds, and it is too easy to forget that the language used to describe objects with radial symmetry is specialized and manifestly ill-suited to get ideas across. If you don’t fold from different polygons on a regular basis, there seems to be a bewildering multiplicity of landmarks and none of them seem to be the right ones. That goes double for regular polygons with an odd number of sides. 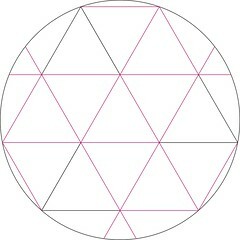 My second class was on cutting a nonagon from a square, using angle trisection. (I will recommend Robert Lang’s discussion of the subject as background — it begins on page 34.) I drew up some diagrams for teaching the method I used to get a one-cut nonagon, but they leave out the whys and wherefores. 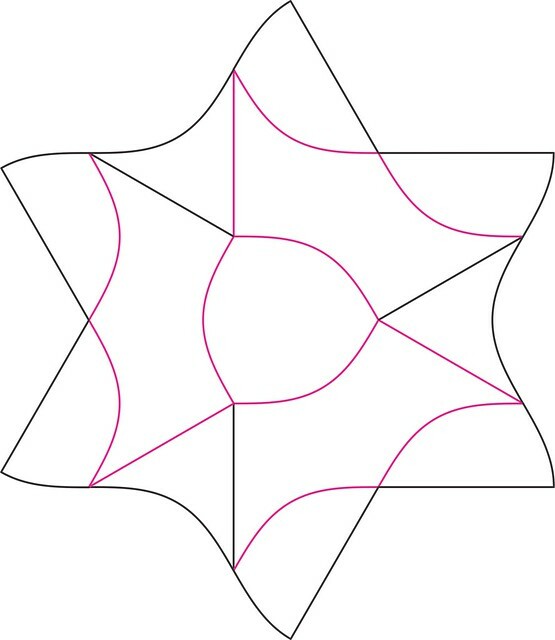 A nonagon has nine sides and interior angles of 140°, which means that we want to fold our square into nine equal slices of 40° each. 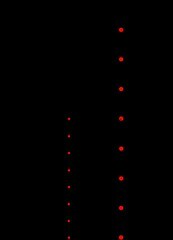 Because 40° × 9 = 360°, right? Getting to 60° is easy — everyone knows this trick, I should think. 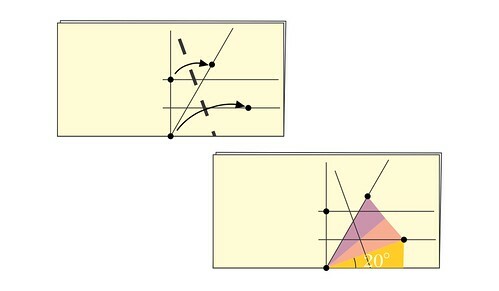 Getting to 40° is not quite so easy, but can be done if you bring two points to two lines at the same time. Like this. Now you have all that, I will offer you the diagrams for the Nine-Sided Twist Star above. Enjoy. Oh, wait, you’ll need a little folding music while you work. I went to a talk last week on protein folding, given by one of the College’s chemistry profs. I was delighted to find that there is a mechanism for correcting folding sequences that go wrong. Any folder will recognize this situation immediately: you get almost to the end and see flaps sticking out in all the wrong places. So you curse a little and then unfold back to the part that you knew was right and start over. Some might say, ah, evidence of intelligent design! Well, maybe — intelligent design is certainly a plausible theory, but it presupposes that humans would be intelligent enough to recognize it if they saw it. There exists nowhere any evidence at all for that. Puny humans. Howsobeit, it is evidence of good design and even Morbo the Annihillator would appreciate that. 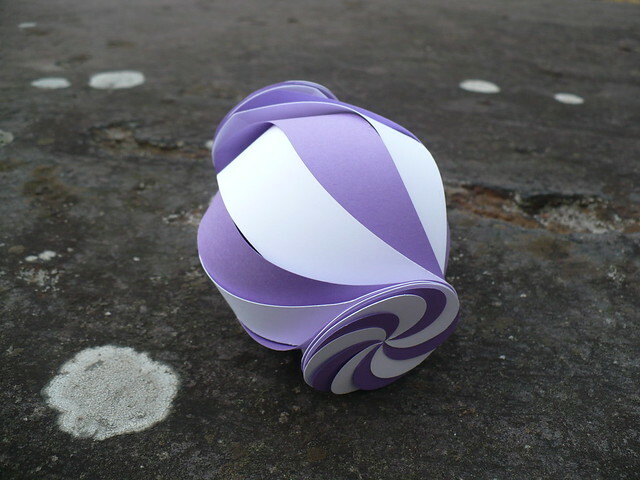 This is a ten-sided yin-yang globe, a modular kirigami model I designed for a friend to use in a gift exchange for the 10th Gathering for Gardner. Martin Gardner wrote the Mathematical Games section in Scientific American magazine for many years and had a big influence on a lot of folks, paperfolders not excepted. My brothers and I first learned of Samuel Randlett’s books from one of Gardner’s columns. My friend, Norton Starr, had four hundred of these models cut and scored at a local press and will be sending them out to his cohort shortly. 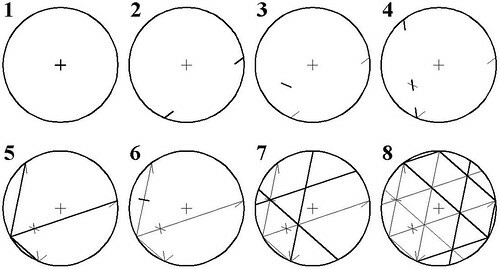 This post contains the directions on how to assemble the model. Step One — Carefully punch out the pieces from the templates. Step Two — Make sure you have cleared all the paper from the inside of the hooks. Step Three — Fold in on the indentations: not all the way, just partially as shown. Step Four — Flip pieces over so that they resemble integral symbols. 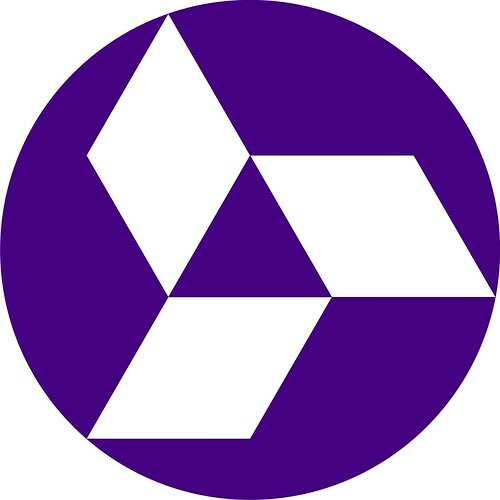 Step Five — Place a white unit on the table and then a purple unit on top of it, rotated approximately 36 degrees counterclockwise. Note how the hooks overlap. Step Seven — This is all ten units assembled. 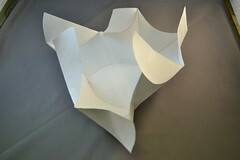 Once you have this, flip the model over, so that the swirling circleStep Eight — Pull and curve up a white unit so that the top is about 3½ inches (10cm) above the intersection. Step Eight — Pull and curve up a white unit so that the top is about 3½ inches (10cm) above the intersection. Step Nine — Pull and curve up the purple unit to the left over the white unit. Hook the ends. Step Ten — Pull and curve up the white unit to the left and hook in the same manner. Continue around the model until you have hooked all ten units. Step Eleven — Hooking the last unit. 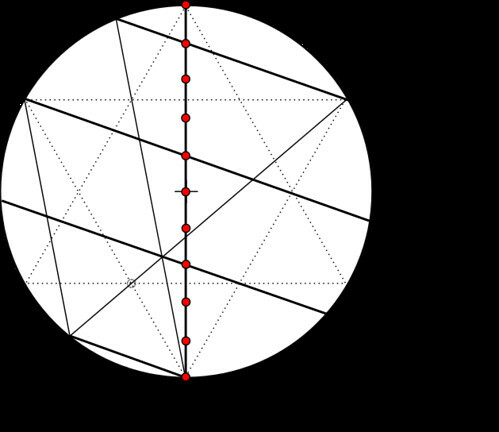 When you release the disk, the model will compress at the equator and even out the angles. 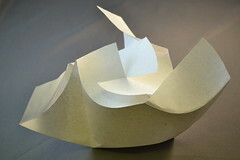 Origami isn’t only an art form, practiced by thousands worldwide, it’s also an Australian jazz trio. And they have an album coming out. This album comes in two forms: the now traditional digital download and as a physical CD with an origami CD cover. A rather attractive model, we think, one that may be familiar to our readers. The packaging for the physical CD has been produced on a sort of pre-industrial basis — the paper was printed and scored at a print shop, but then folded by hand by saxophonist, Adam Simmons and others in his circle. 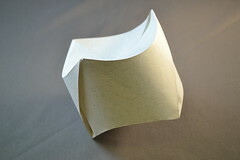 The paper is Teslin, a synthetic stock, used mainly for ID cards — not so easy to fold, but quite resistant to tearing. Obviously, a limited release (Adam mentioned that he’d made several hundred) and bound to become a collector’s item in short order. The music, like the packaging, is intricate in its arrangements, pushing gently at the envelope of its medium. Highly recommended to your attention. This is a QR code bug. It is really just a waterbomb with legs, skinny bug-like legs. What makes it interesting is that it has two ways of reproducing itself. 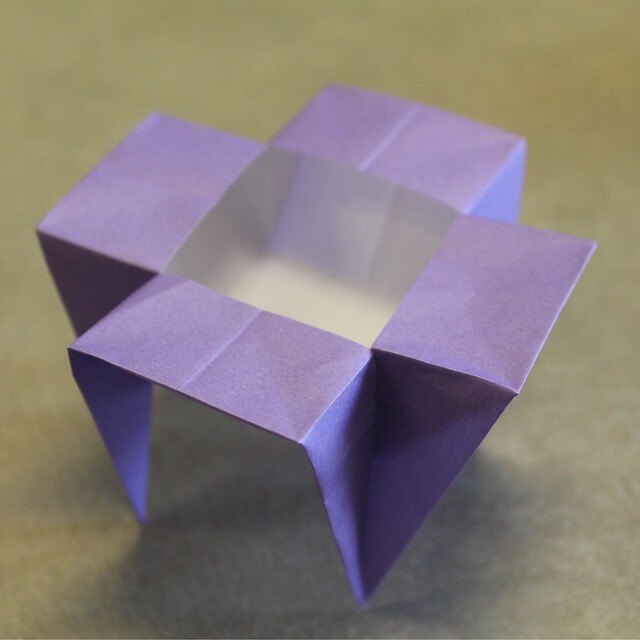 The first is the ordinary way most origami models use to reproduce — folders share them, either by teaching in person or through diagrams and tutorials. 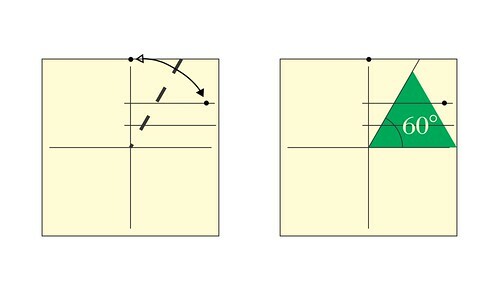 This assumes the intention of the folder in wanting to learn the model and the intention of the teacher in the demonstration or the diagramming. The second method here is one of embedded self-referential directions, a web analog of genetic information. Say this model is left somewhere public, a cafe or bar or bus station, and some geeky boy walks by. 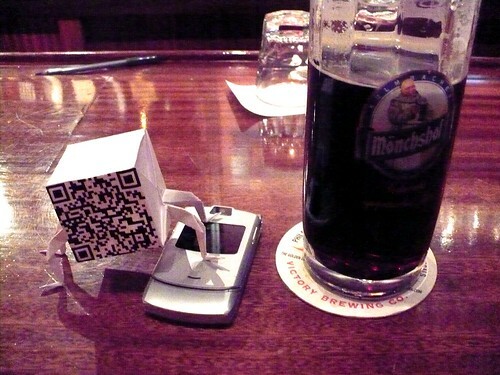 The QR code attracts his interest, he photographs the code with his smart phone and bam! the phone comes up with the page you’re reading with handy links to the diagrams and and special paper. Very meta. The geek prints it out and either folds it or finds some more knowledgeable geek in his geeky crowd to fold it. Thus is the circle of life completed, only to begin again when the geeky crowd runs off to the next flash mob happening, leaving behind the wily QR code bug, where it sits on the table, quietly contemplating its own intentionality. Metatextual reproduction is discouraged or forbidden in some jurisdictions: please consult your local laws before propagating the QR code bug. I was just admiring the calendars on the CDO site and of course, admiration leads to emulation. 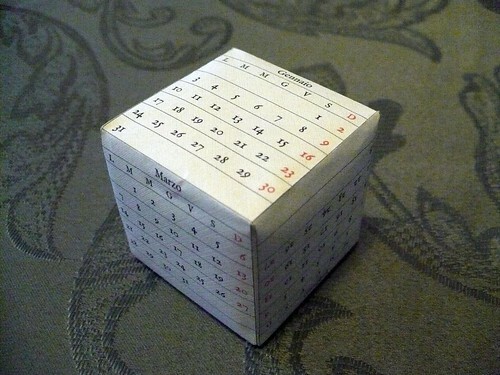 Being a cube, this is just a six month calendar, but when July comes, you can open it up, reverse all the folds and there are the next six, ready to go. June and December aren’t the easiest to read, I grant you, but folding accuracy on this scale is problematic. The type here is Igino Marini‘s wonderful IM Fell Double Pica PRO, which dwells in this world under an SIL Open Font License. Crease pattern here (the curiously versatile jasmine tea cube) and a PDF of the calendar here — print the latter back-to-back. (Schiena contro schiena, forse). While I’m here, let me also point you at a nice video, posted by Leyla Torres, which provides a slower, more in-depth view of how to collapse the Smart Waterbomb. It’s not really clear to me why temples — you’d think schools would be a more likely place for this activity. (You remember how your high school math teacher would post puzzles on his bulletin board?) Were the Japanese scholars trying to amuse the gods with their puzzles? Were the tablets thank-offerings for a moment of mathematical clarity? The book never quite satisfied me on that point. 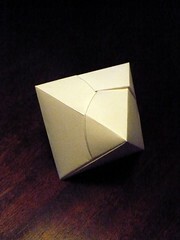 So, Saturday, I had this idea that I wanted to make an octahedral box. There are roughly a gazillion octahedral origami boxes, but I wanted mine a little different, with a pockets and an iris closure on one side. I thought about where I wanted things to go, drew a crease pattern and made the box — it worked well and I was satisfied with the results. I figured I’d do the folding sequence later — it’s usually easier, after the fact. Then Daniel Kwan innocently asked me if there was an elegant way to get to the grid for the model. I said, sure, no problem, and quickly discovered it was a much more complicated problem than I had thought. The center triangle is concentric with the circle and that sounds as if it should be pretty simple, but it’s not foldable in the way we usually do triangular grids. After a couple days, I came up with a triangle I could fold that would give me the right angles, but by then Daniel and Andrew Hudson were already making discoveries of their own. And this works very well, though it might need some fleshing out for the general folding public. Andrew wonders “how much we’re missing by restricting ourselves to squares.” A very great deal, I should imagine. And all of this is good stuff — all of this can be used elsewhere, in tessellations, representational works, whatever. I would encourage you the folding public, to try it out. I was, as I said, satisfied with my box, but rather better satisfied with the conversation that followed it. Maybe the Japanese mathematicians hung their puzzles in the temples because they were there and open to the public, a place travelers would pass through and where locals would visit regularly. Maybe in Edo Japan, the temples were not just places of devotion, but also served as a marketplace for ideas. Sort of like, you know, using a photo site for the exchange of origami techniques.